There are 200 districts, 2,388 public schools, and 128 charter schools in Georgia serving 1,685,016 students. 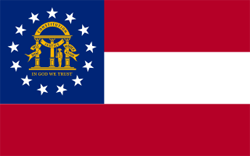 Financially the state of Georgia spends approximately $10,762 per student. There are 111,133 full-time teachers receiving a total of $6,661,759,527 in salaries and $2,226,686,303 in total benefits. 863,521 students receive a free lunch and 123,344 receive a reduced-price lunch.